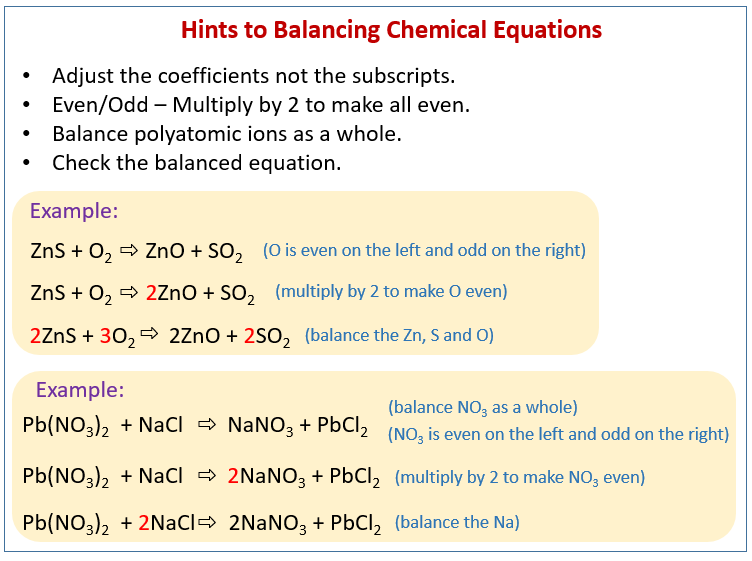 The following figure gives some hints on how to balance chemical equations. Scroll down the page for more examples and solutions. Balancing chemical equations may require some trial and error. There are some general rules that could be helpful, but they may not work all the time. Case 1: If the polyatomic ion remains the same before and after the reaction, then treat it as “a single element” for ease of calculation. Try to start with the most complicated-looking group. The nitrate ion NO3 is unchanged before and after the reaction. Start with Ca(NO3)2 since it looks most complicated. There is one NO3 on the left and two on the left. We test the other atoms and we find that we already have a balanced equation. How to balance chemical equations containing polyatomic ions? Case 2: If the polyatomic ion is changed after the reaction then it would be necessary to consider each atom individually. Use the CHO technique. Since we don't have carbon, we could try to balance the hydrogen first. We have five hydrogen atoms on the left and three hydrogen atoms on the right. Check to make sure that all coefficients are in the lowest-possible ratio. How to balance chemical equations with polyatomic ions by rewriting H2O as H(OH)? Tip #1: Put a star(*) next to any element appearing more than once on either the product or the reactant side; balance those elements last. Tip #3: If you have H and OH on one side and H2O on the other, it is helpful to rewrite H2) as H(OH).